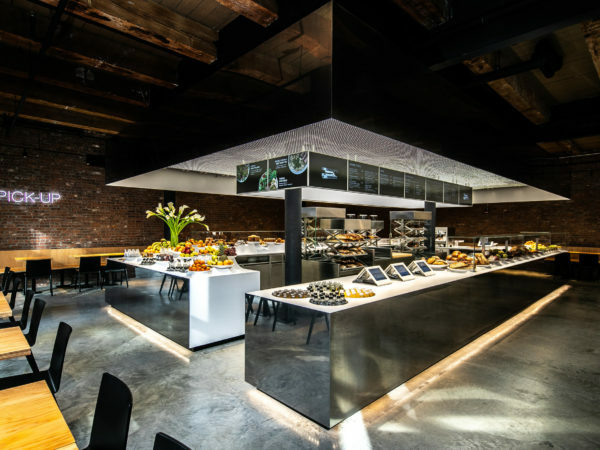 A new Momofuku Noodle Bar in Columbus Circle, hints of a South Korean life in the former Mas (farmhouse) space and other restaurant news. 412 West 14th Street, intersect-nyc.com. 10 Columbus Circle, Third Floor, 646-918-8752, noodlebar-ny.momofuku.com. 39 Downing Street (Bedford Street), 917-409-0689, windroseny.com. Before even getting to the food, there’s the look of this new Chinese restaurant on the Upper West Side: subdued elegance in a muted color scheme, marble tabletops and a mural of mountains and towers done by the artist Qiu Anxiong in the style of traditional Chinese watercolors. One owner, Haocheng Sun, is an art collector. Though the menu includes some popular items, like soup dumplings, pot stickers and dan dan noodles, it also offers a feast for those with uninhibited tastes for robust seasoning and offal. There’s spicy duck tongue, chicken feet with two spices, Xiang-style stinky tofu and deep-fried pork intestine. More conventional are cumin-flavor lamb in a dry wok and sautéed spicy littleneck clams. Pan-fried shrimp in garlic sauce are prepared tableside. The chef, Kaiyuan Li, is a 20-year veteran of the New York restaurant scene who touches on several regions but focuses on Hunan. He cooked at Hunan Manor in Midtown, which Ligaya Mishan praised in a Hungry City review. 258 West 109th Street, 646-928-0522, atlaskitchennyc.com. 464 Amsterdam Avenue (82nd Street), 212-499-4111, mokum.nyc. This restaurant (the name says it all) tucked into a new hotel tower is managed by Yves Jadot and Alberto Benenati, who have a diverse portfolio of places around Manhattan. For now, they’re serving only breakfast; lunch and dinner are coming soon. Next month, Dear Irving on Hudson, a bar and lounge, will open on the hotel rooftop. Aliz Times Square, 310 West 40th Street, 646-609-5122, alizhotel.com. Red-sauce Italian in a setting bedecked with vintage items is the work of Will Durollari, a chef, and his sons, Arben and Kuj Durollari, who work in fashion. The executive chef, Andrea Cinus Napolitano, is interpreting the Durollaris’ family recipes, including braised meatballs and a banana cake. 523 Ninth Avenue (39th Street), 212-517-0939. 371 Broome Street (Mott Street), 646-590-6800, shooshoonolita.com. Williamsburg Hotel, 96 Wythe Avenue (North 10th Street), Williamsburg, Brooklyn, 718-362-8100, thewilliamsburghotel.com. For several years, a group of sushi aficionados has been trying to create a high-end destination in New York with Tadashi Yoshida — a 49-year-old award-winning chef with 30 years of experience and a restaurant, Sushi No Yoshino, in Nagoya, Japan — in the kitchen. They are close to accomplishing their goal, and the restaurant is now to open in the spring. 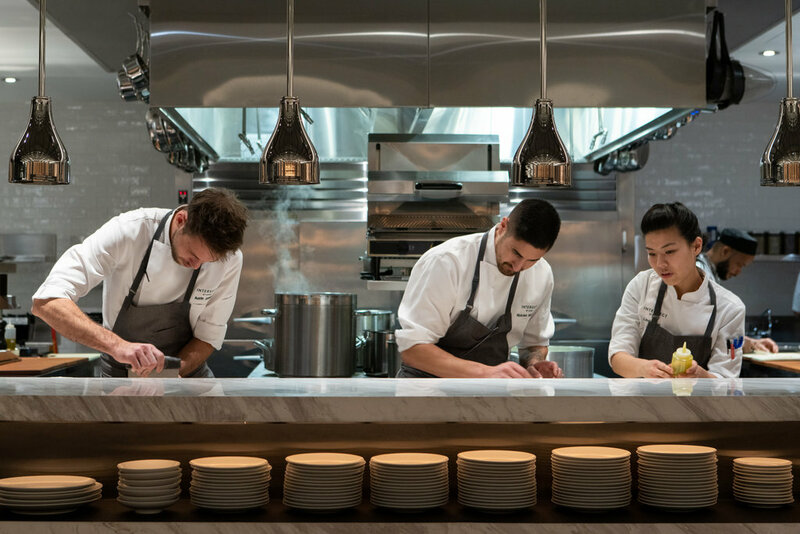 The menu will be a $300 sushi omakase served at a 12-seat counter made of Japanese hinoki wood. Mr. Yoshida is not merely opening a branch of his restaurant, as many Japan-based restaurateurs have done, but is also moving here after closing his restaurant in Japan next month. 342 Bowery (Great Jones Street). The chef, who worked for many years for Jean-Georges Vongerichten and went on to open Loring Place in Greenwich Village, will expand his portfolio next spring with a new place in Queens. As yet unnamed, it will be the restaurant anchor for a new commercial and retail development, the JACX, and will share the ground floor with a food hall and market. 28-07 Jackson Avenue (42nd Road), Long Island City, Queens. Mr. Bono, a native of Sicily who worked with Gualtiero Marchesi in Italy, is the new executive chef at Il Valentino Osteria on the Upper East Side. Mr. Shaner, a chef who worked at Gotham Bar and Grill, Union Square Cafe and Freek’s Mill, has become the executive chef at the Wild Son in the meatpacking district. An earlier version of this article omitted part of the name of a forthcoming sushi restaurant in NoHo. It is Yoshino – New York, not Yoshino.